We all know that news consumption is no longer passive, whether it’s reader comments on a blog post or news article, or individuals starting a blog to have a voice of their own — the evidence is everywhere. Less evident is how search has fundamentally changed how we consume news. Instead of passively accepting the information provided by any single news source, search has taught us to be active news consumers, so seek out news from the wealth of sources on the web. Well, it turns out a lot of other people don’t know that Stearns has an “a” in it. Overnight, I started getting an avalanche of traffic because the post was ranking for searches with the keyword “Bear Sterns” — after I corrected the error, it started to rank for searches with with correct spelling. In most cases, my post appeared in Google blog search result cluster, which Google sometimes adds to a search result the same as it does with Google News results (part of Google Universal Search) — this appeared at the bottom of the search result page. My post was a meta news story, i.e. 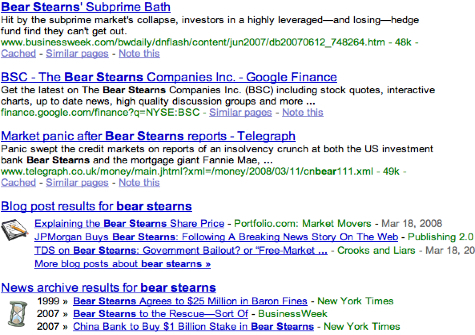 it didn’t have any real news about Bear Stearns, it just discussed how the story was being covered. Despite all these limitations — ranking for misspelling, not appearing as a main search result, and having a less than newsy title — I still got thousands of visits. Imagine how much traffic the top search results got. The real significance is what this tells us about news consumption on the web. When a news story is of great interest, news consumers are not content just to read what CNN, Yahoo, or NYT have to offer. Instead, they go to the one place where they know they can get information from many different sources — they go to search. how did jp morgan buy bear stearns? how did the government help sell of bear stearns? Still not convinced that search is driving a fundamental shift in how people consume news? 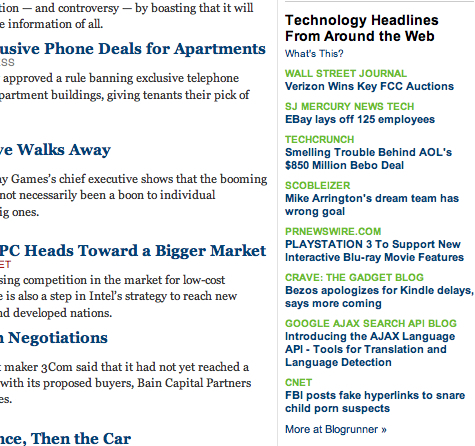 Still believe that most people are content with their favorite news site’s homepage? Well, don’t take my word for it — ask news sites about their faith in maintaining and growing direct traffic to their brands. 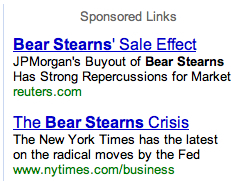 Yes, that’s right — those are ADS for news about Bear Stearns on Reuters.com and NYTimes.com. If you search for news on Google, you’ll find these ads everywhere, e.g. The Financial Times is advertising its news. 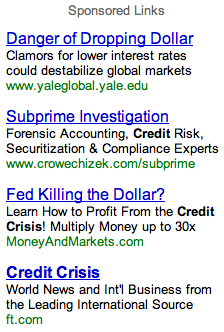 Even Yale is advertising its global news blog. And why? Because these news brands are savvy enough to realize that they have been disintermediated, and that news consumers may turn first to a site like Google that can give them coverage of a news story from EVERY source on the web, not just one. New York Times killed TimesSelect because they realized more people would discover that content through search than would coming in through the NYT brand front door — and all of those news consumers coming in through search are casting a net as wide as the web. News brands that only publish their own version of the news will increasingly disappoint news consumers whose expectations have been fundamentally changed by search. Publishing only your own content is increasingly a great way to accelerate the disintermediation of your news brand by other brands that give news consumers more of the wealth of the web. Increasingly, news consumers will read a news brand’s reporting on a story of interest and say, OK, what else have you got? So rather than just publish their own technology content, NYTimes.com is aiming to provide news consumers interested in technology with more of what the web has to offer, by publishing links to the best technology news on the web. Of course, these are links off of the NTY site, but they are simply applying the Google rule of linking on the web — the better job you do sending people away, the more they will come back.